Harvey Updyke has a Twitter account. He’s had one for a few months. If you’re one of the 746 people currently following him, you know that he hates his HP computer, just saw Rise Of The Planet of The Apes (and told a kid who was texting in the theater to be quiet—the kid liked his Bama hat), and recently found and took in a baby squirrel (presumably for companionship) and for some reason named him Spike (“…my Lab Bama tries to get him, that’s not going to happen”). You also know that he recently changed his profile photo. We know what the alleged / confessed Toomer’s oaks poisoner looked like in high school. 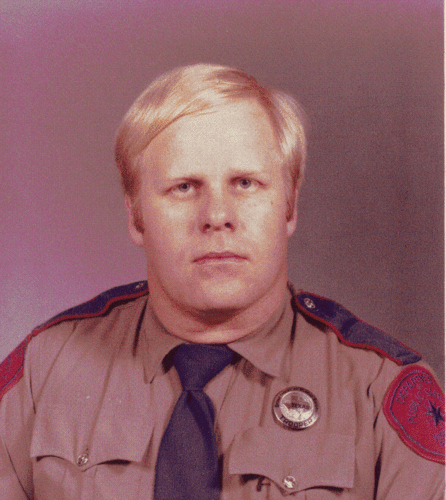 Now we know what he looked like during his time as a Texas State Trooper. Related: Did Auburn students roll Toomer’s Corner after Bear Bryant died? His eyes just have that crazed look, even then! But then again, doesn’t EVERY turd fan have this look at one time or another? I realize for some, however, it is permanent due to their psychosis. “The eyes are the windows to the soul.” It’s a proverb for a reason! Even Bear Bryant would smack this man up side the head!!! No true Bama or SEC fan would disrespect tradition in such a manner! Roll Tide!!!! What a crumby blemish on a fine state. Sorry Texas. I guess there are bad cops everywhere. All deference to the great state of Texas, but I just can’t look at this outfit’s color scheme and NOT think “Hitler Youth.” Harvey’s evil mug doesn’t help. hope he gets shafted by a branch w/herbicide while in prison. just too many sore loser inbred morons in this world.